Add milk, cinnamon, and honey and continue to beat until ingredients are well combined. Soak each side of bread in egg mixture. In a frying pan, melt butter over medium heat and sauté bread for approx. 2 – 3 min. per side until golden brown. 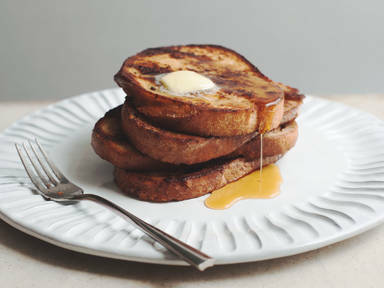 Cut diagonally and serve with maple syrup.